Colorado American Shorthair Rescue View other American Shorthairs for adoption. Greetings, everyone! Eddie and Jesse here to let you know that we have 'broken up' (so to speak). After we settled in at the Welcome Center (where we came to live while waiting for a new forever home since we lost our mom this past spring), we realized that we are no longer a bonded pair. I (Eddie) discovered that I am really a one-cat kind of guy, who wants my person's attention all to myself-I live to be dedicated to her or him and will be a lap cap as soon as that lap is available. And if you have Carl's Jr. chicken strips to eat, please share them with me-they are delicious! I am a 5-year-old, 12-pound, neutered male with shiny black fur and big gold eyes. I am an indoor-only kitty, who enjoys lying in the sun, playing with orange pipe cleaner circles, and snuggling on a soft blanket when I'm not snuggling with my people. I really like cardboard scratchers, and raisin bran-I would love to share a bowl with you! Let's get together, so we can disprove all those silly black cat superstitions and have a happy life together! 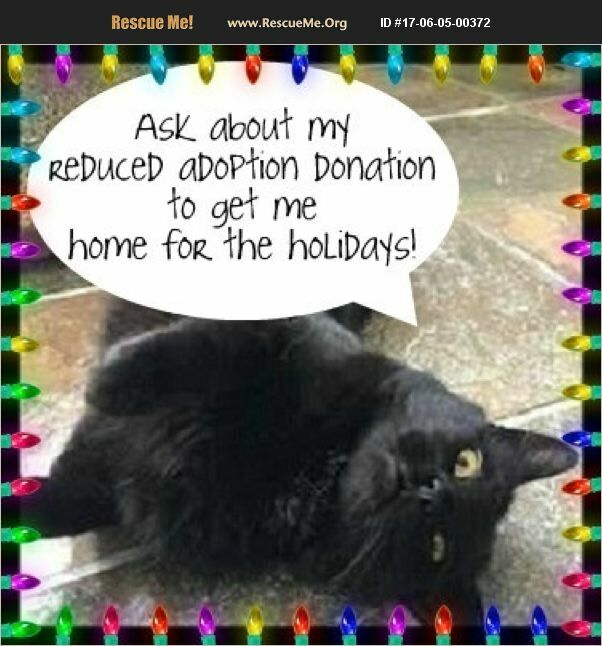 *Ask about my reduced adoption donation* Contact Safe Place for Pets on the web (safeplacepets.org) or by phone (719-359-0201)-hope to meet you soon!